Curtis Iaukea was a football star at the University of California..
Late 1967: Chico Garcia (Curtis) & Krusher Kowalski defeated Nicoli & Boris Volkoff to win the MWCW Tag Team titles..
Summer 1968: Chico Garcia engaged in a bloody war with The Big “O” which resulted in Garcia’s departure from the area. Curtis Iaukea was teamed with Baron Scicluna to win the WWWF Tag Team titles with Lou Albano as their manager! February 1, 1972: King Curtis Iaukea & Baron Scicluna w/Lou Albano defeated Karl Gotch & Rene Goulet for the Tag Team titles..
Curtis Iaukea returned a few years later with the Grand Wizardas his manager to challenge WWWF Champion Pedro Morales. 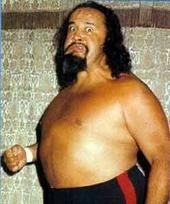 King Curtis Iaukea was a huge star in Australia during the early 70’s. October 12, 1975: King Curtis defeated Dusty Rhodes for the Florida Heavyweight title in Tampa..
April 5, 1979: King Curtis defeated Jim Garvin to win the Florida State title in St Petersburg. 1986-1987: King Curtis (as The Wizard) managed Kamala and Sika before leaving the WWF and Mr. Fuji took over his clients. 1995: Curtis Iaukea was the figurehead-leader of the Dungeon of Doom in WCW as “The Wizard”..
October 2003: Curtis Iaukea might possibly be working in Hawaii on Waikiki Beach renting out surf gear..
2005: King Curtis made a rare public appearance in a big charity event in Honolulu for the National Alzheimers Awareness Society..
December 5, 2010: King Curtis Iaukea (73) passed away at his home in Honolulu with his wife and two daughters.